This festival will commemorate the 80th anniversary of the Spanish Civil War and will also open a space to reflect on the contemporary refugee crisis. 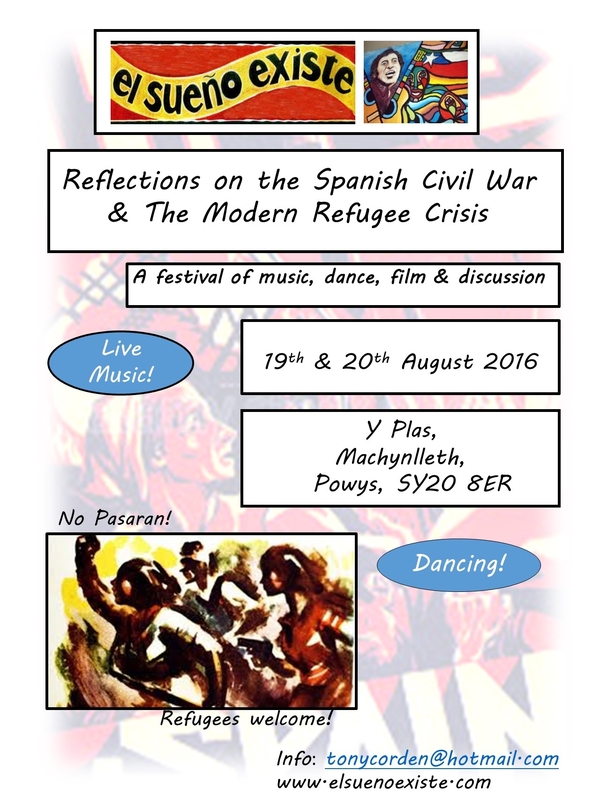 The festival will take place in Machynlleth, 19 to 20 August 2016. The festival will start on Friday, August 19th, 2016, at 7.15 pm. There will be a showing of the acclaimed film by Ken Loach : Land and Freedom on the Friday evening. Ken Loach has been invited to the screening. On the Saturday we will hear from Adam Feinstein;Nerudas Biographer about Pablo Nerudas role in the evacuation of refugees to Chile during the Spanish Civil War. There will be many other talks and discussions throughout the afternoon. In the morning a Chilean group will be presenting an event called : We touched the Sky. 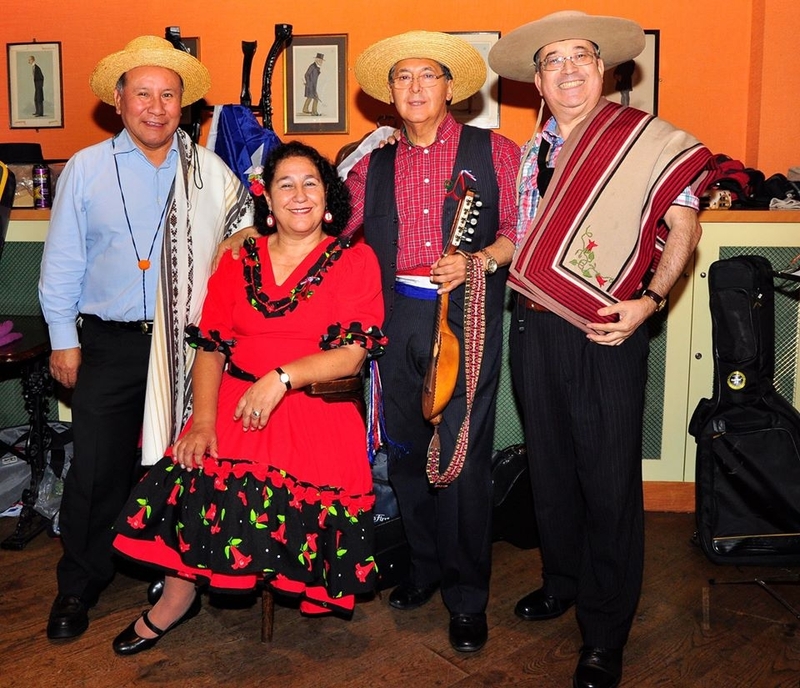 The Saturday evening will be dance time with great new Chilean ensemble : Los Copihues Rojos and mesmerising Bolivian group: Rompiendo Fronteras. Rompiendo Fronteras (‘Breaking Boundaries’) brings together musicians from Chile, Bolivia and Britain in a ravishing celebration of progressive Latin American politics and culture. Whether interpreting anthems of revolution or Andean hymns to Mother Nature, the group’s vocal harmonies and original arrangements highlight the power of song to transcend social and national divides and support social justice. Pilar Lopez Martin will be presenting ‘Libres’, a concert and a lecture, storytelling and folk song. It covers the events of the Social Revolution in 1936 Spain and brings the music of the freedom fighters of those days and also images, music and poetry about the events. ‘Libres’ also brings the story of the M 15 social movement in Spain or movement of the Indignad@s that started in 2011; this movement was of huge relevance to Spanish society, transformed the hearts and minds of many; out of this grassroots organizing new political parties were formed (Podemos, Ahora en comun …). “Libres” brings the latest political developments and looks at the country’s response to the escalation of the “Refugee crisis”. East London based Elizabeth Carola (Siren Press) and Maria Andrews (Manifesta Film) have collaborated on four topical political documentaries for social change. Our film Elpis documents a moment in January 2016, at the height of grassroots refugee solidarity efforts in Lesbos, just (two weeks) before the EU directive to close the border, stop the boats and criminalise the humanitarian project. On Saturday will be the launch of “We Touched the Sky…..”. This is a new online educational resource,freely available, hosted by the WEA (Workers’ Educational Association). An opportunity to learn online about the Chilean experience, via video interviews with exiled Chileans living in Britain. They tell their life stories, from their initial inspiration as Allende and Popular Unity came to power (1970), the extraordinary achievements they were part of, and their personal experiences in the run up to and on the day of the coup (Sept 11 1973) and its aftermath. The course is scheduled to be online and available from August 2016. The material can then be accessed and ‘studied’ totally flexibly.To access this free learning opportunity go to: http://wea-yh.org.uk/chile2/. The Spanish Civil War – and especially the murder of Federico García Lorca exactly eighty years ago – marked the crucial turning point in the life and work of the great Chilean Nobel Prize-winning poet, Pablo Neruda. Adam Feinstein, Neruda’s acclaimed biographer, will talk about Neruda’s passion for Spain, his close friendship with Lorca and his remarkable rescue of more than two thousand Spanish refugees from Franco’s fascism (shipping them out from southern France to Chile in 1939). He will also read some of Neruda’s beautiful poetry inspired by Spain and the Civil War. Rob Campbell will be presenting ‘What is Socialism?’, a talk that will be held at The Bowling Club, Machynlleth, on Tuesday 16th August at 7.30 – 9.30 pm. Socialist thought played a big role in the Spanish Revolution. Many socialists and communists from Britain fought in the ‘International Brigade’ (including my great uncle) and many of them died fighting for what they believed in. They were motivated by sets of ideas such as anarchism, communism and socialism. In view of recent developments and because many people out there may be new to politics the local philosopher Rob Campbell is providing this free and introductory talk on socialist thought. Free but donations for El Sueno Event and to cover cost of hall. Advance tickets available from Penrallt Books, Machynlleth.